Before I restarted my screencasts a month ago I had an average of 35 daily views. Then in the past month it went up to an average of 115 views per day. 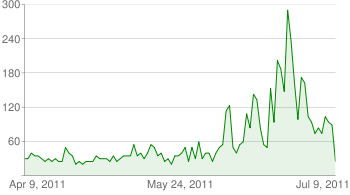 That's mostly due to the initial peaks when I release a new screencast. In the last week when I have not released any new screencast it went down to an average of 80 views. I guess this would be the long time average if I did not upload any new screencasts. This is the chart YouTube provided for the last 3 months. On one hand these are nice numbers but they are quite far from what the viewer counts of elmexable. There were more that 6000 viewers in 2 days of his first Construder video. You know, the 3D game he wrote in Perl. Then there was the first Mojocast it seems it managed to generate a lot more buzz than any of my screencasts. He got lost of positive comments even from Ruby programmers! Congratulations to Glen Hinkle. The 3 screencasts I made are all Padre related and they are part of my experiment to create a set of video based tutorials on how to use the editor. I even created a new page for all the Padre related screencasts. Going over every (important) menu item. Looking at specific features and their configuration. Trying to accomplish specific task that might involve several features. How do you learn a new tool? The View menu of Padre including Syntax checking, Outline, List of Functions, Project browser and more. The File menu of Padre mostly basic stuff but also including example and default Perl files and sessions. Autocompletition in Padre has several options. This video explores those options.